Verizon’s shiny new 5G mobile network went live yesterday, promising big things in the speed department that most home internet connections can’t match. Big Red has stated that customers will see typical download speeds of around 450Mbps with peaks close to 1Gbps. Naturally, we want to know if those numbers are real, so we’ve been on the hunt for speedtests. Thankfully, Verizon’s PR crew has not been shy about posting some early numbers. In two separate tests that were posted within the past 24 hours, we saw one speedtest (above) hit 760Mbps down, while a second test topped out at around 560Mbps. The second test was showing off Verizon 5G speeds versus AT&T’s 5GE, which is not a real 5G network and shouldn’t stand at a chance. As the test proves, Verizon’s 5G network is the real deal for now and that 5GE, since it’s really just a 4G LTE Advanced connection, can’t hang. The two tests were run outside of US Bank Stadium, where the NCAA Final Four will take place this weekend. 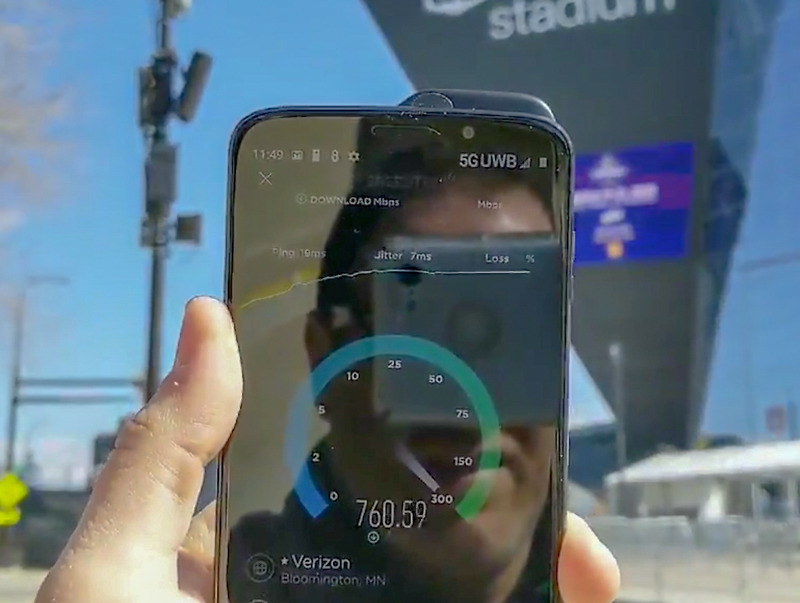 That’s in Minneapolis, for those who don’t know, one of the two Verizon 5G launch cities (the other is Chicago). 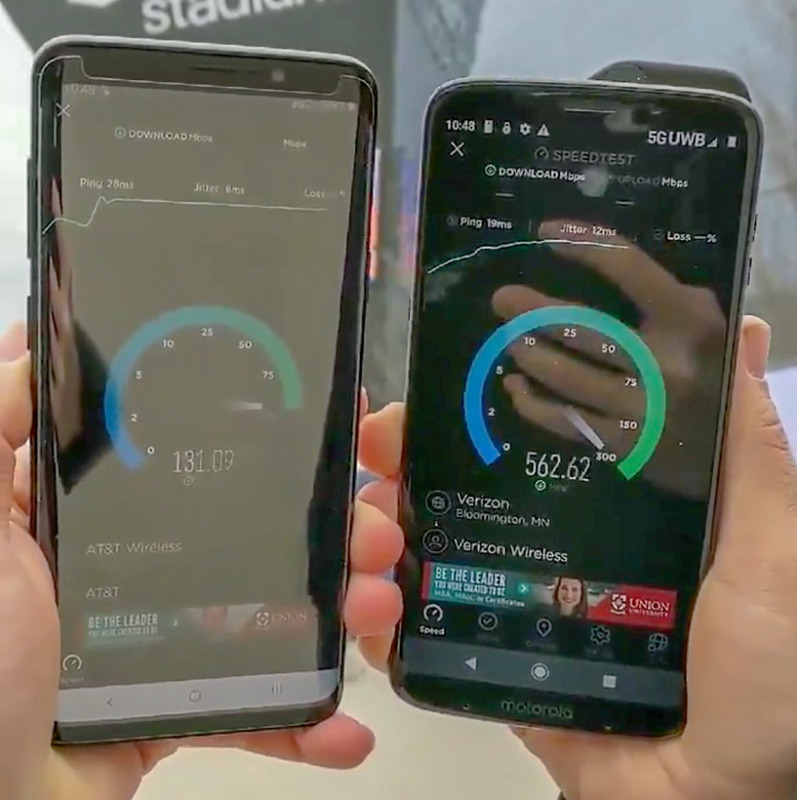 The Verizon reps used a Moto Z3 with an attached 5G Moto Mod that can both be purchased today for access to this new 5G network. Of course, these tests are somewhat meaningless at this stage because there are so few connections to Verizon 5G. The Moto Z3 with a 5G Mod is the only device currently capable of connecting to it and I can’t imagine many own both. The real test will be when thousands of people in that stadium all want to jump on 5G at the same time and try to stream the wonders of the Final Four. That may not happen for years, so for now, we’ll just enjoy the massive speeds of a fresh, unused and unoccupied network. On a related note, what in the hell is that “5G UWB” logo? We get it, Verizon, you want to call your 5G network “5G Ultra Wideband,” but that logo has got to go.